Oh, Moose. Moose, Moose, Moose. Releasing figures in unannounced "Waves." 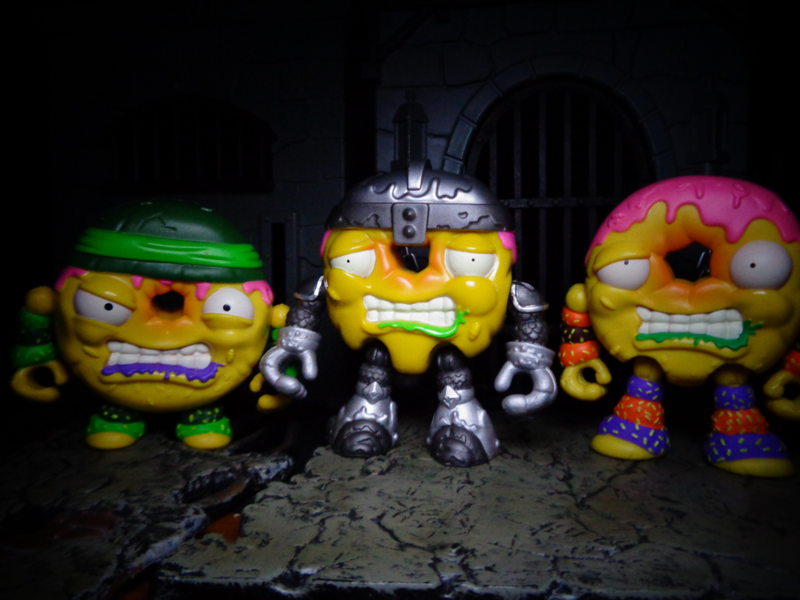 So, Wave One of the new Grossery Gang figures was two pizzas and some gum. Wave Two seems to encompass every other action figure... but wait, there's apparently a three-man Wave Three just beginning to arrive! What that means is, this won't be the last review. But I've got the pumpkin, doughnut, shark, potato, and can of beans! The spray can, toilet, and trash can will just have to wait until their wave shows up. But man, oh man. So many figures, so much fun. Have you ever wanted a cyborg Terminator pumpkin? Or a punk rock potato? Or how about a Scottish Braveheart hamburger? That's the kind of thing we're dealing with. 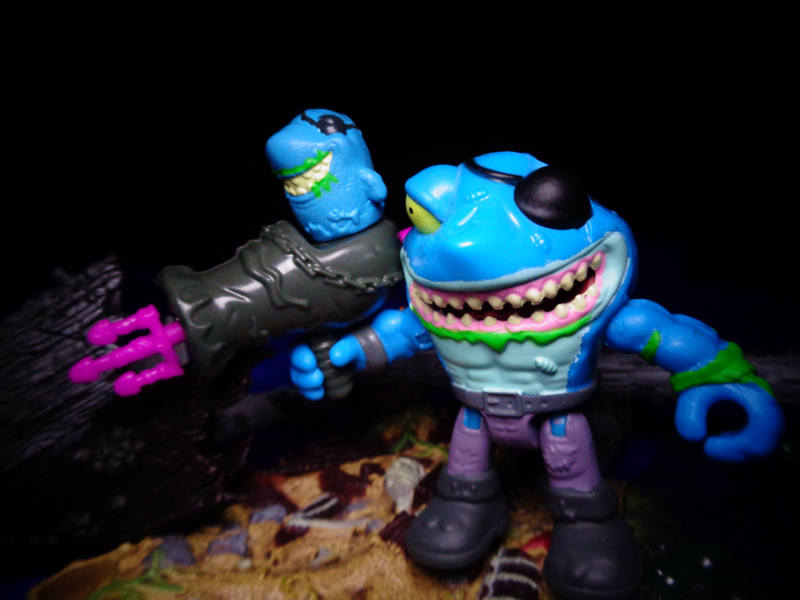 The figures no longer have action features built into them, but rather use flick-and-launch weapons, just like the others from Time Wars wave one. In fact, let's talk about distribution for a second. Moose does this. They do not announce which figures are in which wave, leading to uneven distribution and frustration. Right now, Target is full of bananas and bugs from two series' ago, from a third-wave case that arrived late. 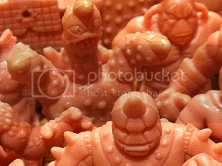 You have to get really lucky to find these figures... though rest assured, they are out there. 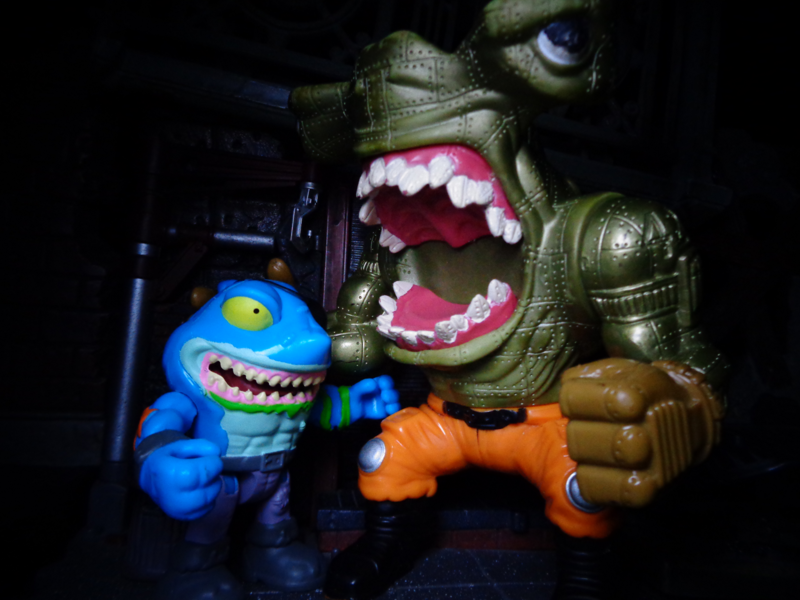 Wave Three might be a genuine headache to acquire for another review, but I will try! Okay, enough bellyaching, let's have a look! 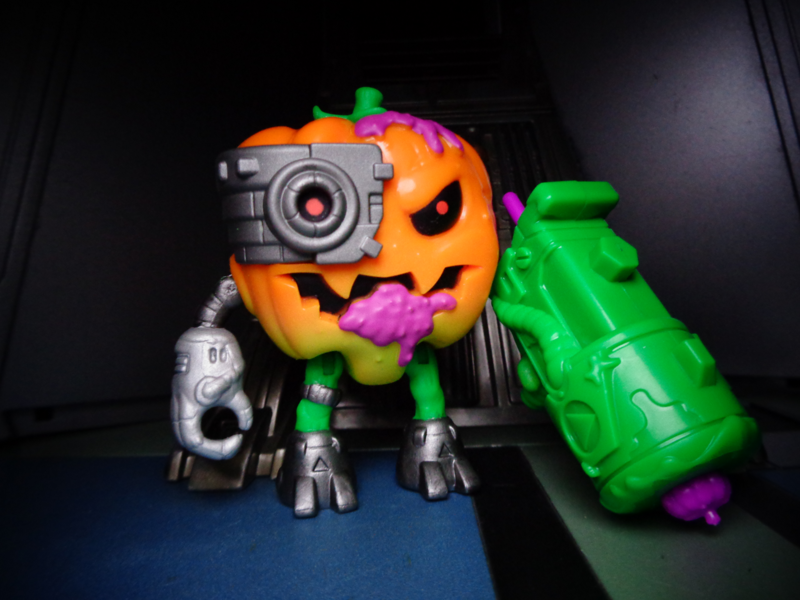 Space Jump Pumpkin is a vile veg from the future. 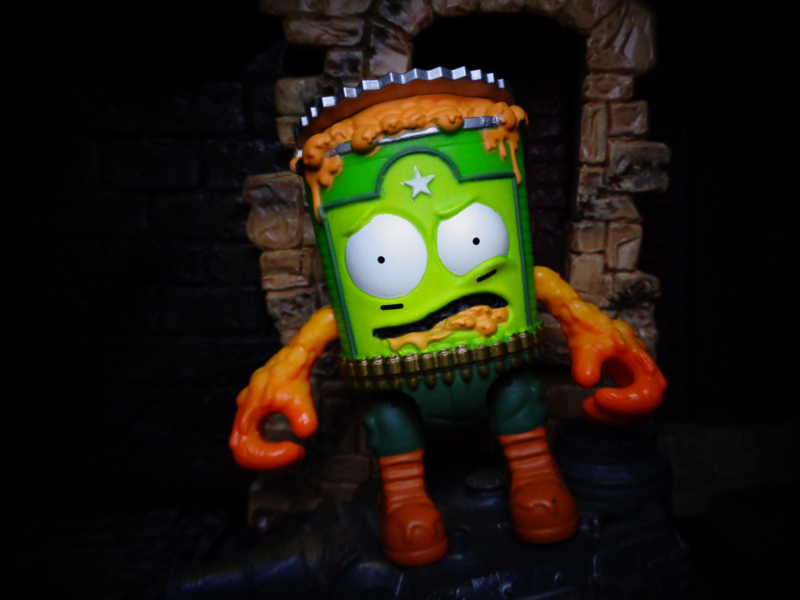 He's hard headed and uses his thick skin to attack the Grosseries. 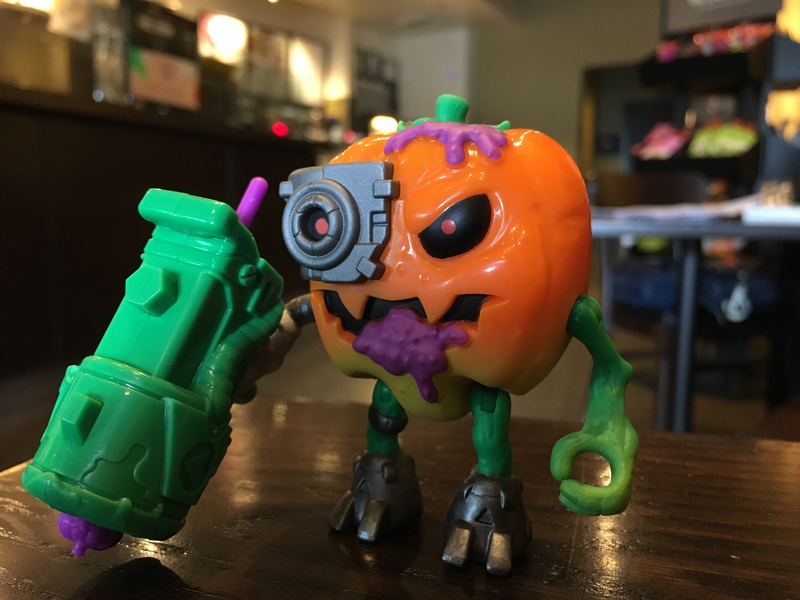 With his pumpkin flicking shooter, he's out to squeeze as much gross from the Grosseries as possible. So stay off his patch if you don't want to be smashed! 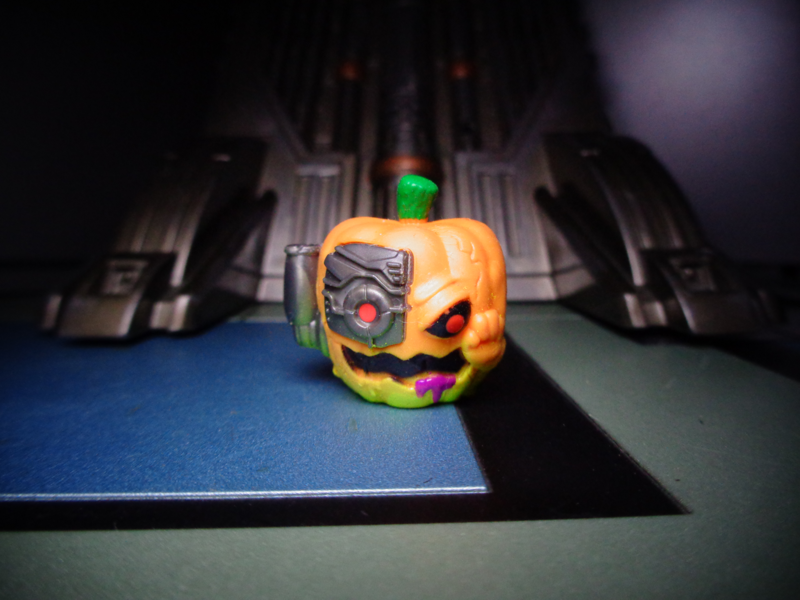 The second villain of Time Wars is a cyborg terminator pumpkin! Yeah, he's pretty much the perfect concept I never knew I needed in my life. 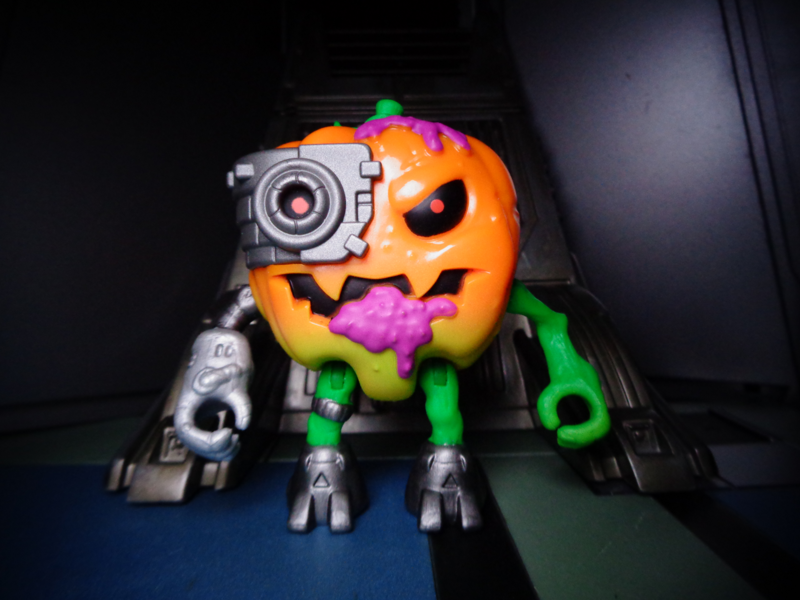 Space Jump Pumpkin is a less complex design than the cyborg pizza slice (note that he doesn't have uneven shoulders), but that cleanness of sculpt (minus the green slime) makes for a pretty coherent cyborg. His cannon fires pumpkins, too. The mini is a great specimen - one of the plastic-rubber hybrids that this line features, which are my absolute favorites from it. if only it was all durable plastic, and not fragile soft rubber. And of course, the little guy clips on top of the big guy's gun for an amazing exercise in metaphysics and temporal paradoxes. 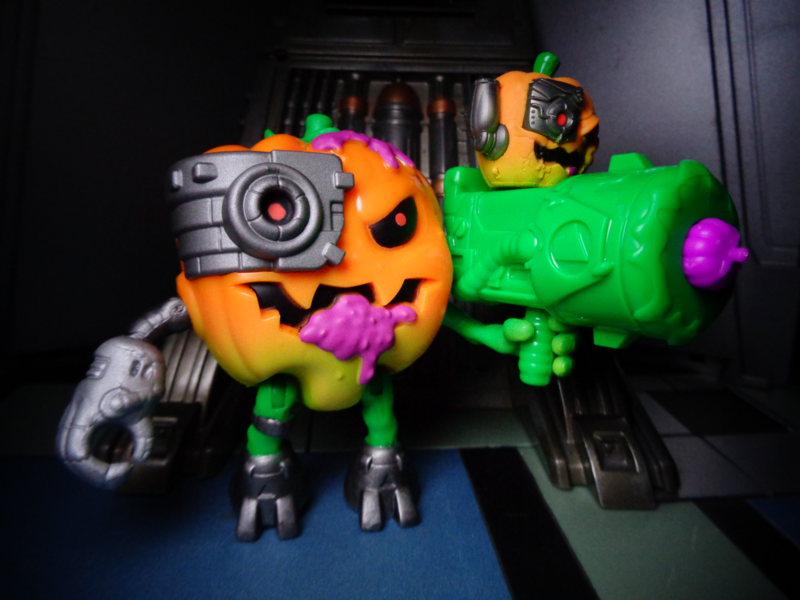 Space Jump Pumpkin sets Space Jump Pumpkin on his gun, and the universe does not implode. Look who's been sucked up from the Medieval Muck! 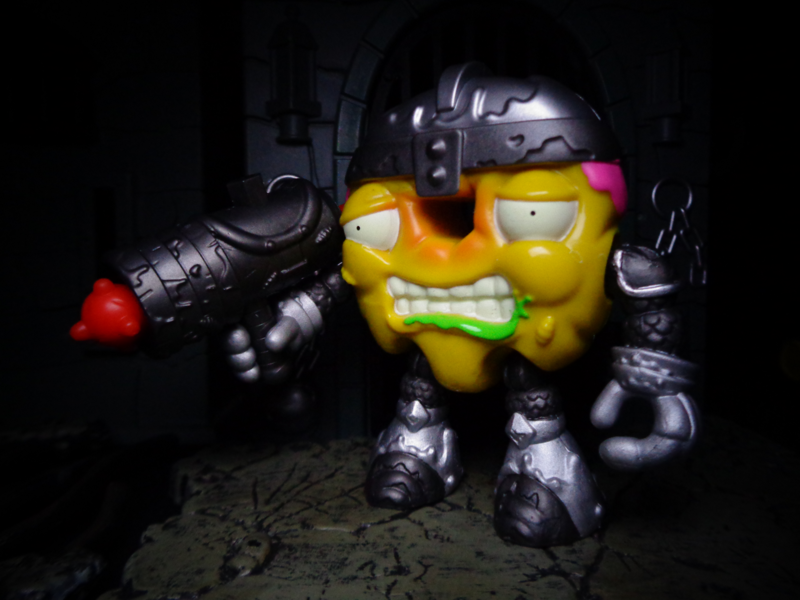 Dodgey Donu is a knight in slimy armor! 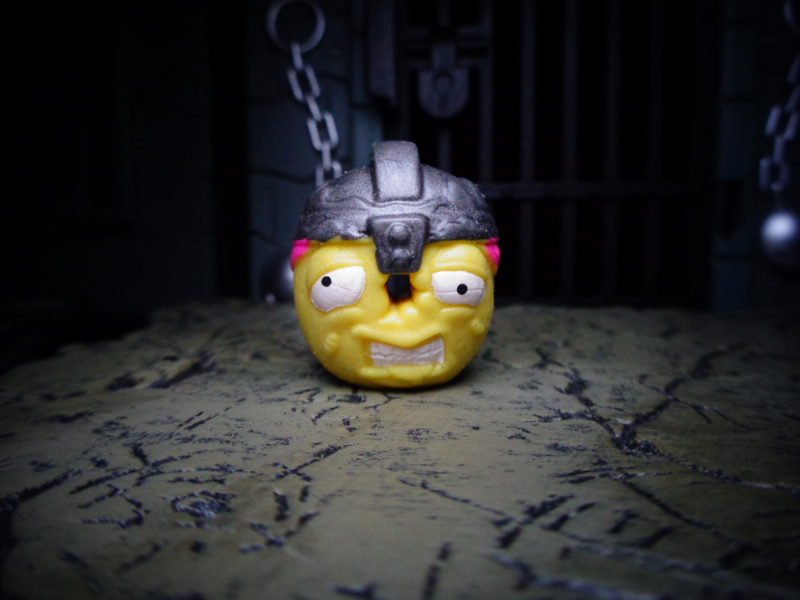 He loves to chuck his mace of muck, but doesn't like jousting other knights - The last thing Dodgey Donut needs is another hole in his head! 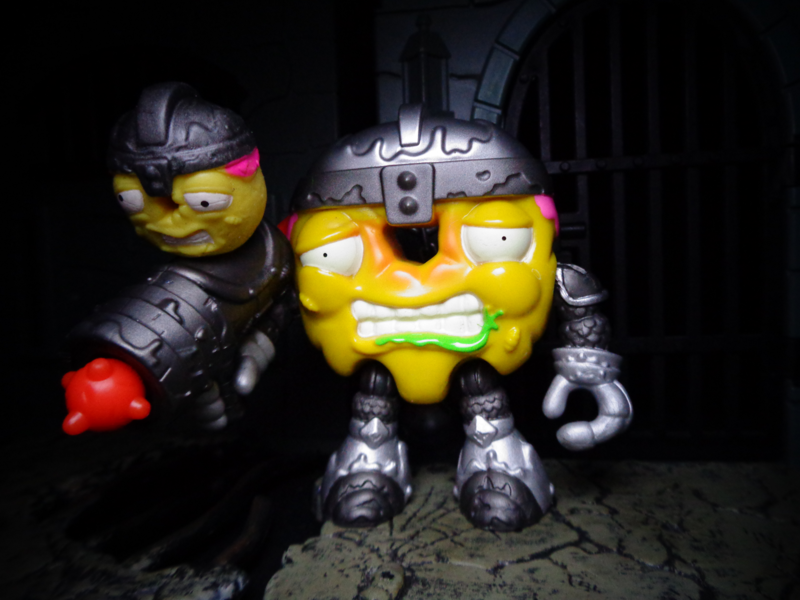 He's ready to take on the Rotbots and gallantly protect his gross friends from a rotting end! 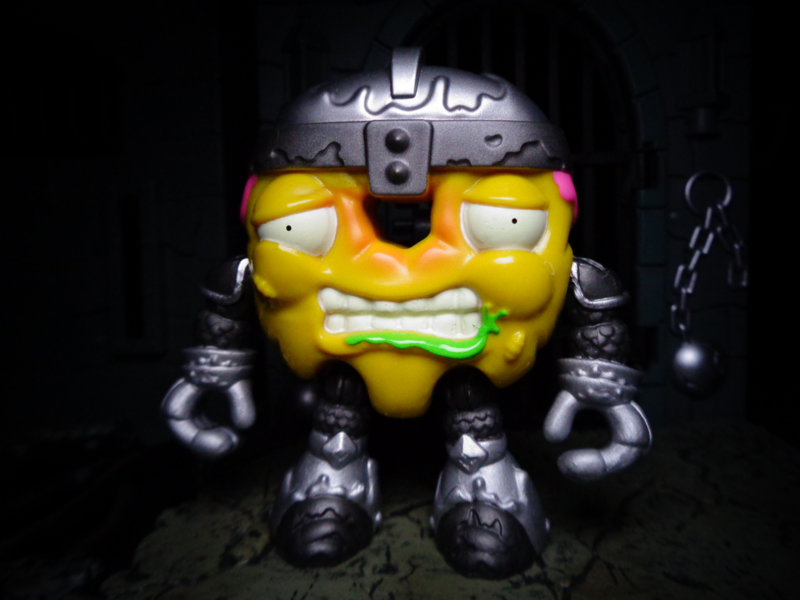 Putrid Pizza is prehistoric, Gooey Chewie is a ninja, and now Dodgey Donut is a knight! Covered in armor, he may look like a cyborg from a distance, but nah - he's medieval enough to include a "gun" that fires spiked mace balls! His mini is a little resculpt of the last two doughnuts, and it really does fit. Man, he looks exasperated, doesn't he? 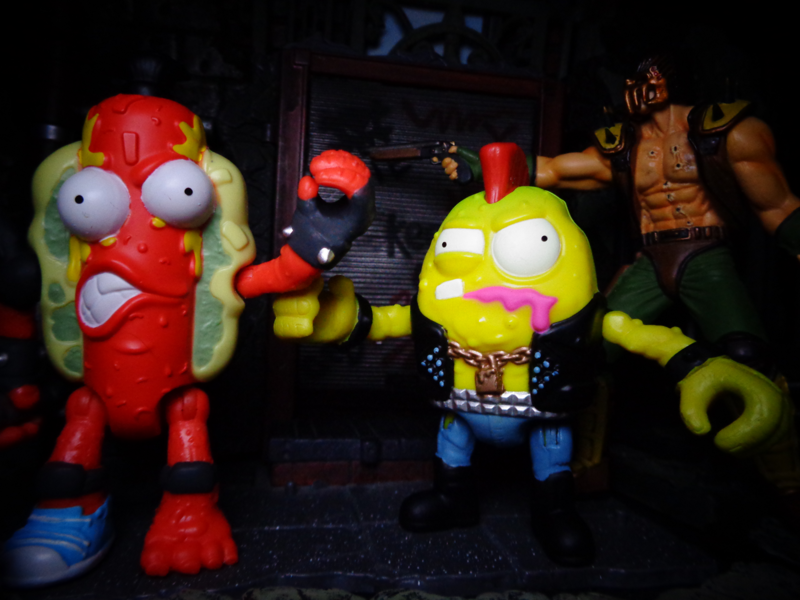 The resculpts are filler, true - but at least they're creative, and not just repaints! 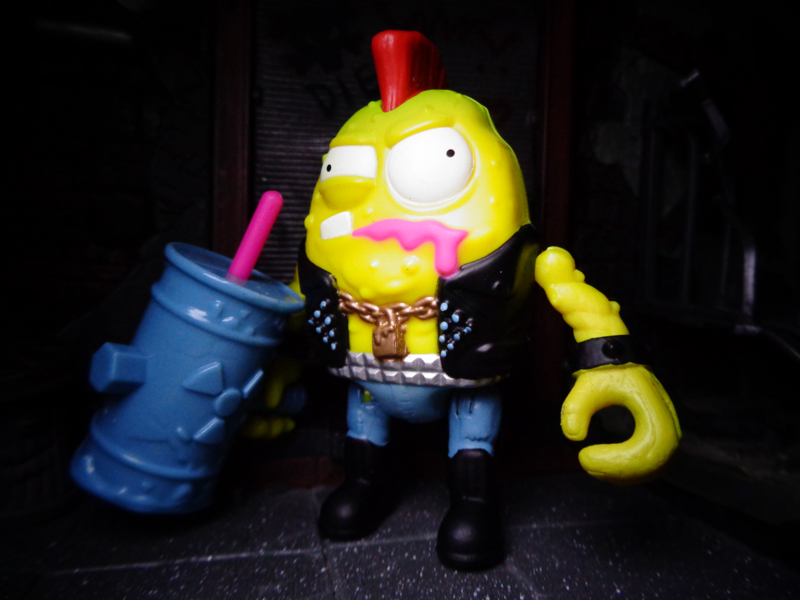 Meet Potato Punk - A punk who looks like junk! He dug himself out of the compost bin to help his gang of Grosseries fight the Rotbots. He's ready to take a mashing for his buddies and will always chip in where he can. 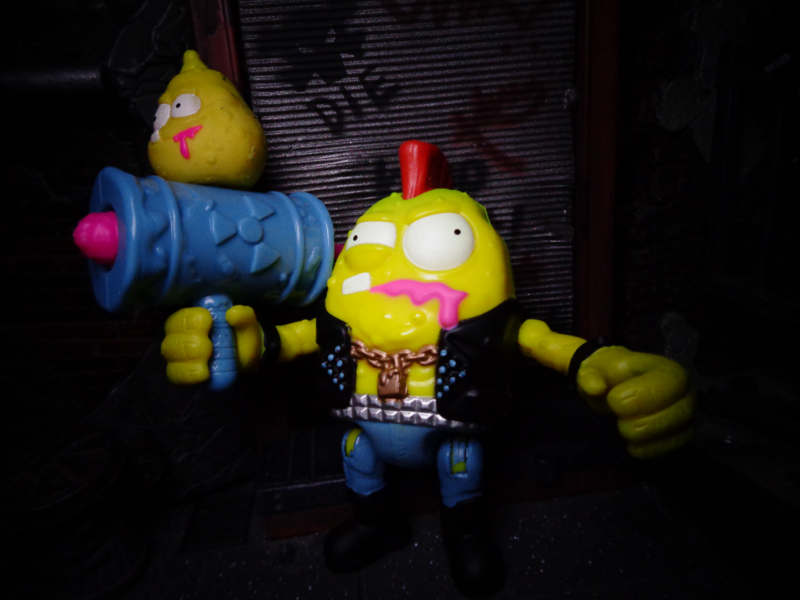 Potato Punk is a spud who knows how to shoot crud with his Toxic Waist(sic) Flicker! Hey wait, an '80s punk? I thought these guys were from historical periods! Wait, the '80s were over thirty years ago. 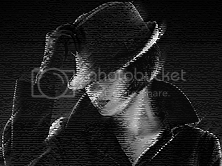 The time between now and the '80s is the same as the time between the '80s and the '50s. Dangit, time! Stop progressing! 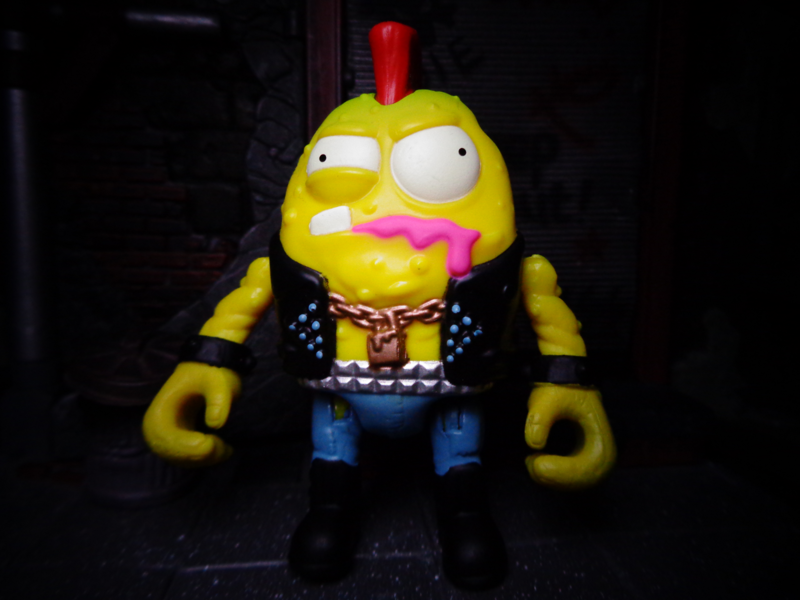 Anyway, Potato Punk is exactly what you think - a potato who's a punk! 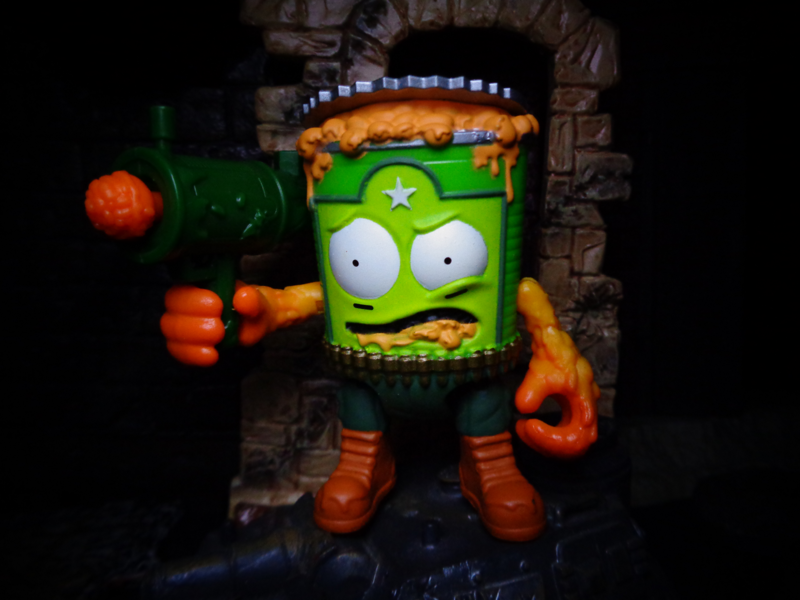 And his weapon appears to be a barrel of toxic waste that launches potato-shaped missiles. The little potato doesn't look like a punk... or a potato. 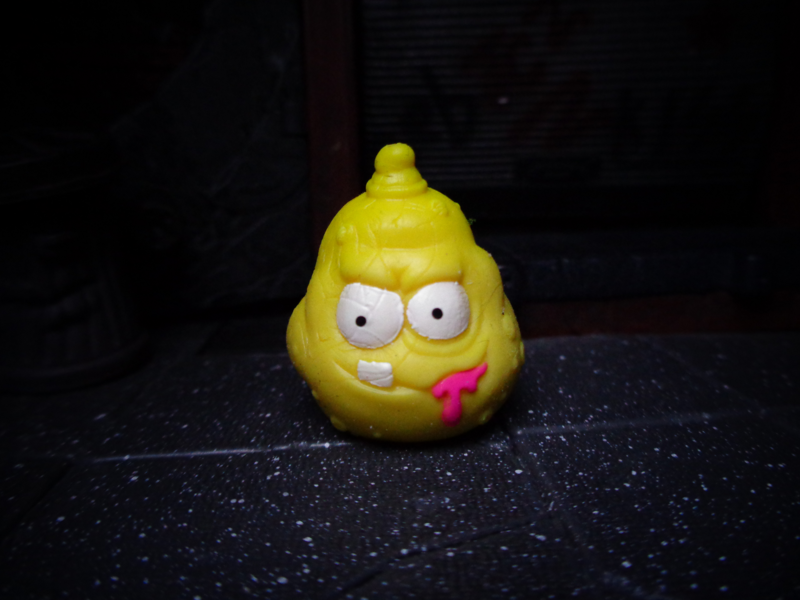 Thanks to that weird little topknot, he looks kind of like a bag of garbage, or maybe an oddly-shaped chicken nugget. Odd, that. In fact, I think this is the first straight-up potato in the line, so it does kind of make sense that he's generic. Still, though, the figure has such strong sculpting, but the mini is kind of... there. But hey, we've still got a great glimpse into the long-lost past of... the '80s. Jock Slop Burger in(sic) a nasty piece of meat from the land of the Scots! 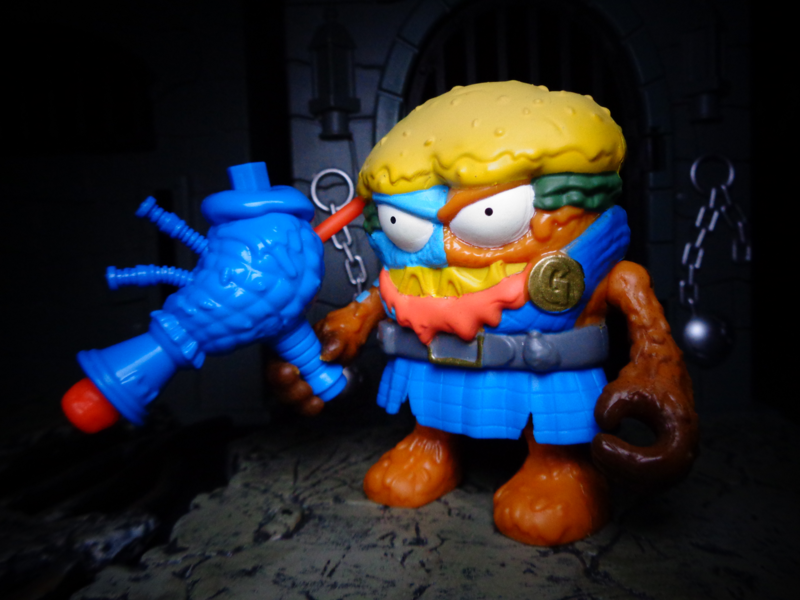 He'll take on anyone with his saggy bagpipe highland flinger! Jock proudly wears the McGrossery tartan when he goes into battle. 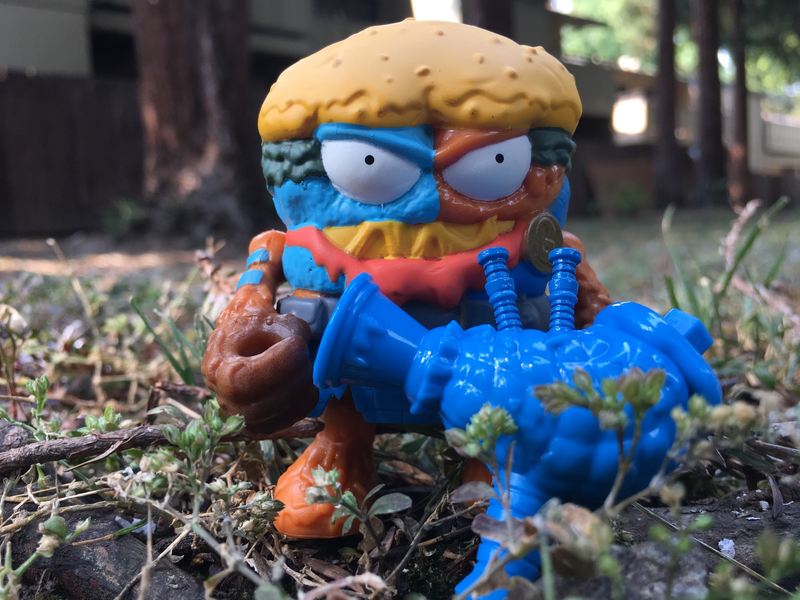 This guy is stacked full of stink and ready to show his brave heart as he battles the Rotbots! "Jock Slop Burger" doesn't sound very Scottish. Here, have some free suggestions: Robert the Burger. William Walletuce. McBeef. Beefheart. Beefy Bagpipes. Big Mac. Come on, guys! And the McGrossery Tartan is apparently just blue. Also, he looks like a muffin, not a burger. A muffin! It's in the proportions. But then, he is wielding a bagpipe like a gun, which makes up for many sins. The mini is just a little too tall to really look like a burger. 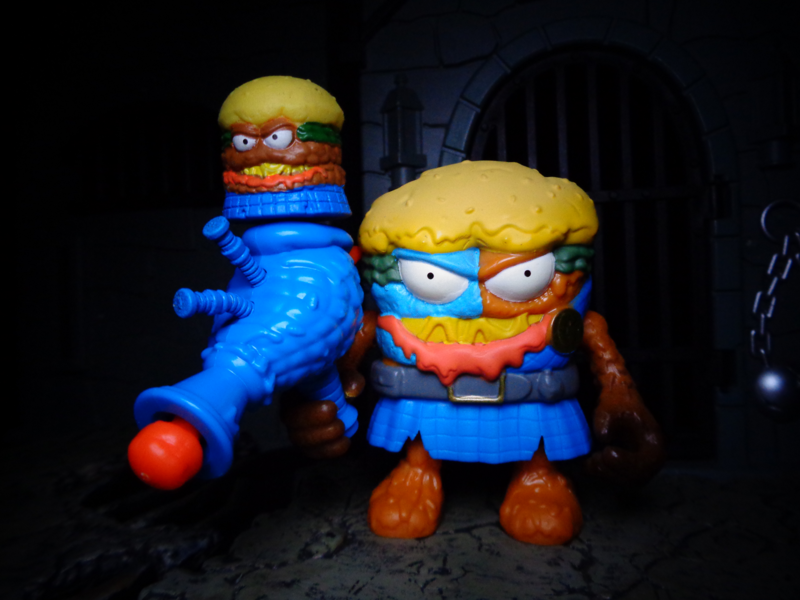 I mean, sure, if you know what he is, it's fine, but they didn't really sell the "hamburger" concept of the figure. Cute little kilt, though. You just know his buns are bare underneath that. Ha ha. However, in spite of that, I refuse to dislike the figure. I mean, come on! He's a Braveheart burger! How hilarious is that? Okay, let's get this straight. 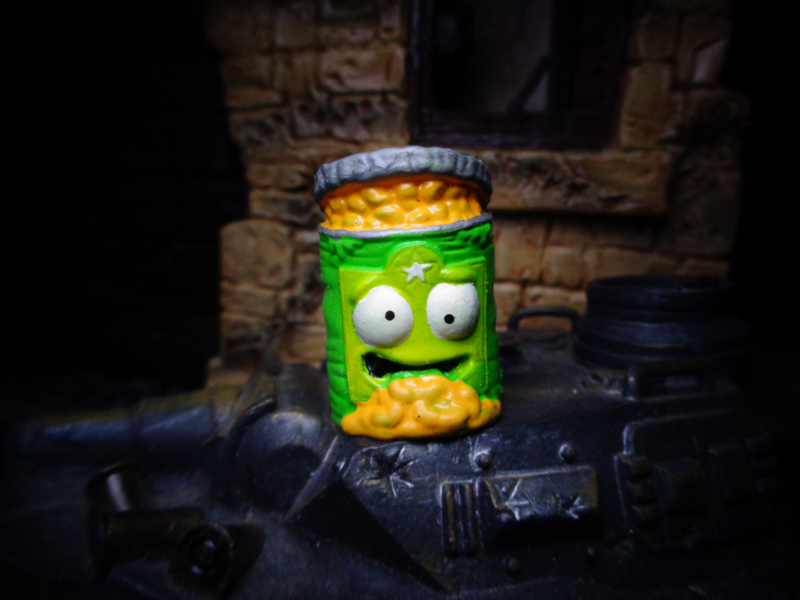 He's a World War II can of beans. French Resistance, telling from the mustache. 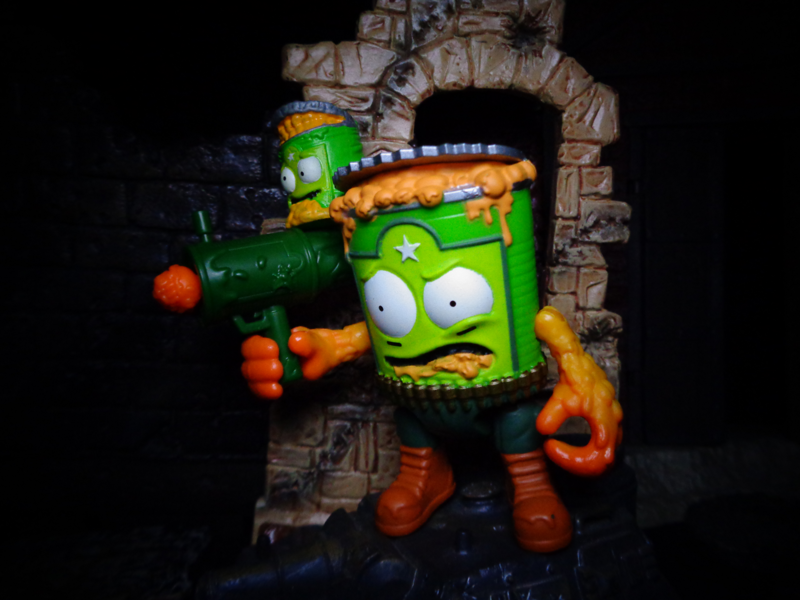 And he has a bazooka loaded with globs of baked beans! I have a feeling that this guy was originally planned for Bug Wars, but then got pushed up a series - and since he can pass for WWII, he fits in with the time travel theme. With the exception of the mustache, the mini is pretty identical to the bigger figure! I appreciate how these figures have been "old" style, and not the two-handed weapon-wielding design that the regular figures sport. It just works better that way. 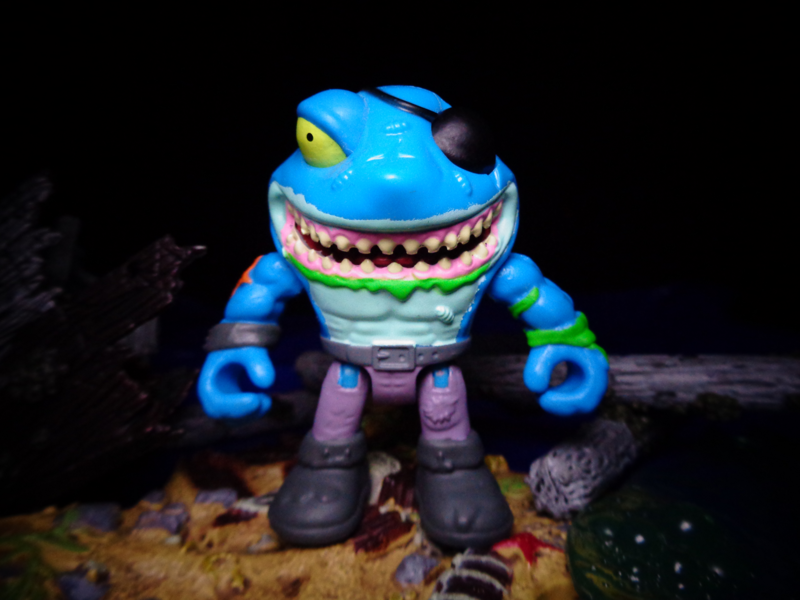 With a festering fin and slime-covered skin, Pirate Sharrrrk is one of the most putrid pirates to come up from a sewerage pipe! He has a jaw full of sores and teeth like a rusted chainsaw. This powered up white pointer is ready to help the Grosseries fight against the Rotbots! It's time for a Pirate Shaaaaarrrk attack! Look, it's a Street Shark. Literally, a Street Shark. This is not a complaint, I love Street Sharks. 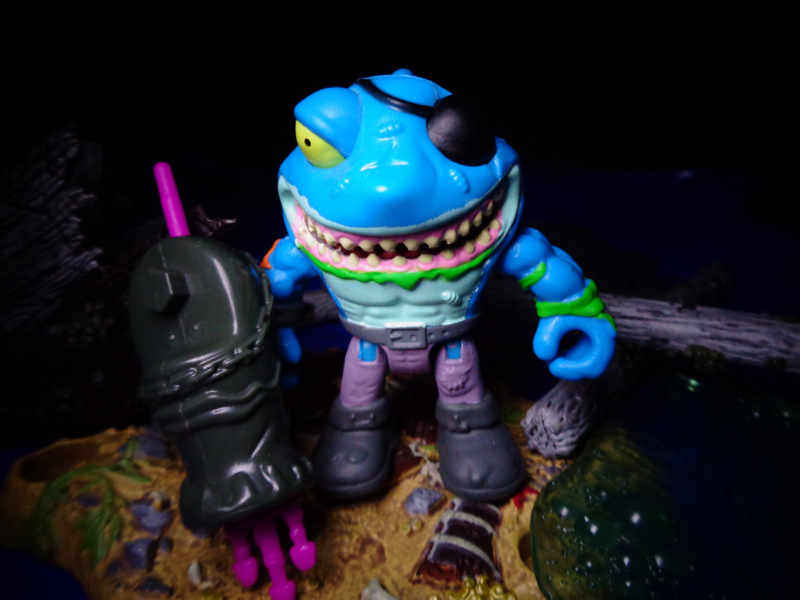 Pirate Sharrrrk (four rs, darnit) is covered in maggots as a tiny concession to the Grossery theme, but that's cool. His mouth has actual depth, more than one would expect in this line - it's a mouth! With teeth! That's sculpted all the way to the throat! He also carries a trident-launching weapon. Pirate Sharrrrk is one of the most in-demand of the line, and it's not hard to see why. The mini is all right, but suffers a bit from paint - it isn't case in blue, it's covered in it, and thus the detail seems soft as a result. It would look much better if the fine details were painted, with the base rubber just colored blue - like with most of the mini figures here. Ah, well. 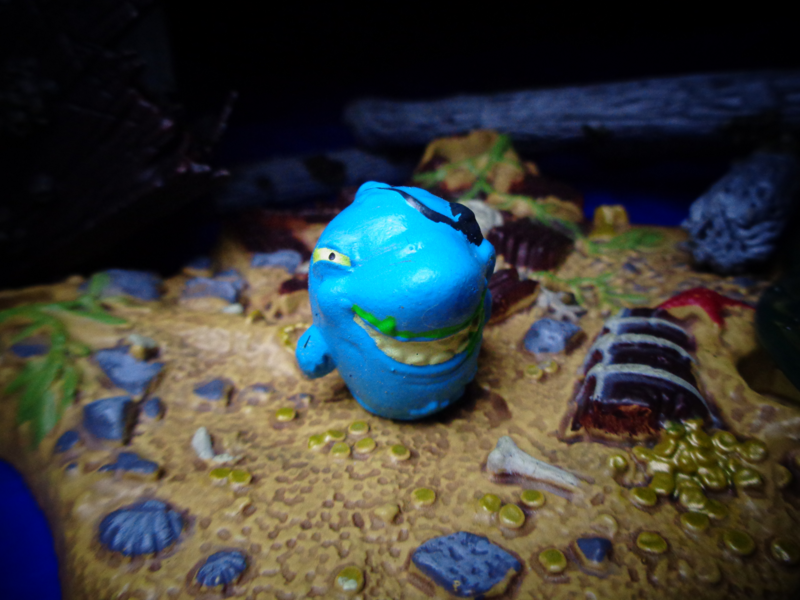 Pirate Sharrrrk is a brand-new character in the line... but so are most of the other ones here. Dang, he's cool. And because he's cool, he's also kind of hard to find, tending to sell out pretty quickly. But take heart, Moose's distribution means that he has an even chance of showing up in greater numbers in an upcoming assortment! Well, there you go! 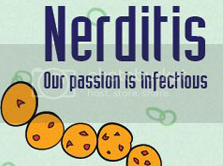 More time travel, more puns, more cyborgs! And a shark! 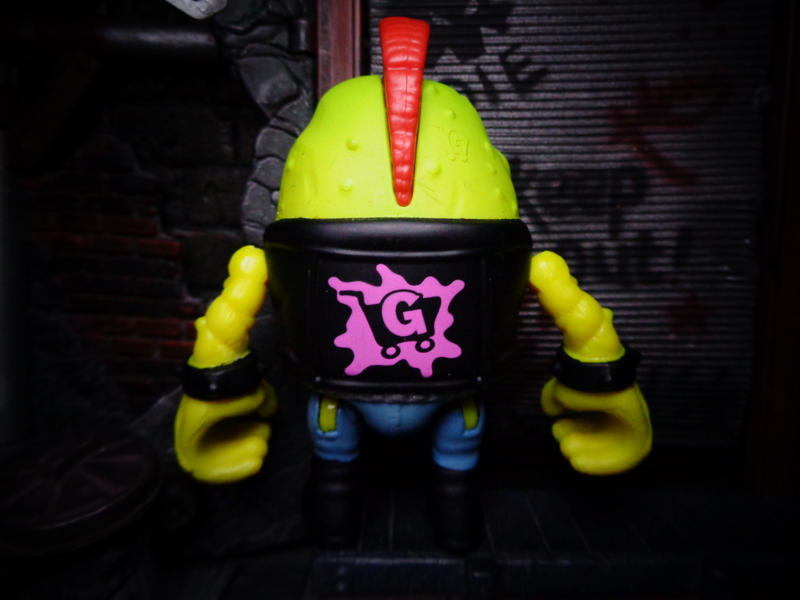 The next wave has a'90s rapper spray can named Grotty Graffiti (remember what I said about the '80s and history? ), a toilet named Spewy Looey who seems time-generic, and a resculpt of Trash Head that I can't figure out (masked wrestler? superhero). We will see them when they arrive, but in the meantime, these are really solid. 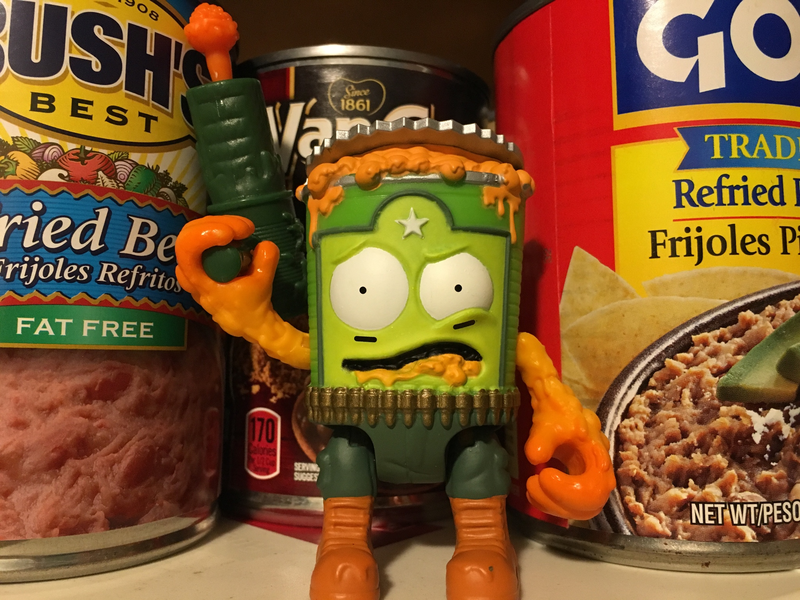 Sure, the burger looks like a muffin and the can of beans could fit in the last series, but I'd be lying if I didn't say that the pumpkin is one of the best this entire line has given us.